The police today banned the marriage processions on main roads in the city to ease out traffic chaos during marriage season. 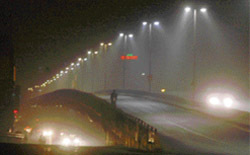 After a comfortable power supply situation all through the summer season, the Punjab State Electricity Board (PSEB) has introduced restriction on power supply to mixed feeders (comprising domestic and commercial consumers), as also rural feeders under the 24-hour power supply scheme in the state. 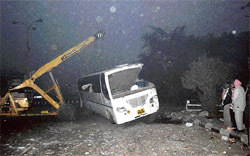 Three persons were killed and 13 were injured, one of them seriously, when a bus carrying 45 members of a Delhi-based catering company, F and B Catering Services, hit a tree after the driver failed to negotiate a curve at the Arti Chowk in the wee hours today. Congress leaders of the city today threatened to launch a Satyagraha over the failure of the police to nab 23 persons who had allegedly beaten Congress councillor Satwinder Singh Jawaddi and his father in the district courts complex on November 1. After being in a state of limbo for about five years, the Department of Agricultural Journalism, Languages and Culture of Punjab Agricultural University, Ludhiana, has finally come into existence. Protesting against the implementation of entry tax on sugar from backdate, sugar traders in the city held a dharna at Kesar Ganj Mandi chowk here today. Shops of sugar dealers in the city remained closed today on account of the protest. The ongoing drive of the municipal corporation against temporary encroachments on the roadsides has evoked protests from the Rehri Farhi Union, Punjab. The union has threatened to take to streets if they were not allowed to stay put. The transport department has decided to auction the fancy numbers in Ludhiana. About 800 special numbers will be auctioned at Circuit House on November 28. The auction was withheld for about six months. Malkiat Singh, foster son of a double murder convict awaiting death for killing his wife and daughter, whom he had raped also earlier, has won a small battle with his relatives, including his sister, allowing him to file a plea against the death penalty after days of intense emotion-filled family drama. Acting beyond his age, Sahil Sharma, a lad of Sihar village, persuaded his parents and grandparents to be a 'green family' and strive to make a world record of planting and nurturing maximum saplings every week. 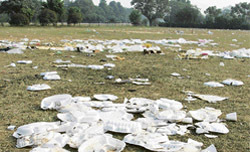 Apart from left over food, litter and garbage were strewn all over the ground after the 27th All-breed Championship dog show organised at Punjab Agricultural University (PAU) here today. The Dehlon police has arrested another accused of a murder case in which six persons were booked for allegedly murdering a woman of Sayan village, about a month ago. One of the accused was taken into custody on the following day of the incident. 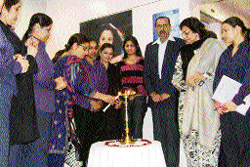 VLCC observed anti-obesity day at its Sarabha Nagar centre here today with the launch of "wellness meter check." The facility was formally launched by civil surgeon Dr S.P. Sharma. As winter has settled in, the parents are taking special care of their kids from cold waves. But on the other hand, the children of primary schools, zila parishad, anganwadi and schools which are running under mid-day meal schemes are going to school without wearing thermals. Deepak Kumar and Ramandeep Kaur (MBA-II) of the department of business administration at the Ludhiana College of Engineering and Technology (LCET) were selected by ICICI Securities at a recruitment drive conducted at GNIMT campus, Model Town, here today. Even after more than 18 months of the indictment of examination supervising staff of MGMN Senior Secondary School in the infamous student’s suicide case, the DC, Sangrur, has yet to act on the recommendations of then SDM, Malerkotla, who had proposed action against the superintendent, the deputy superintendent and the invigilator on duty at the centre on the day of the incident. The District Bar Association today condemned the incident of serial bomb blasts in the court complexes in UP, which had taken several lives. Lawyers observed a strike in court, protesting against the rising terrorist incidents. Terming skin to be the strongest barrier to check entry of pathogens of various dreaded deceases, Dr Monika Bharti, a skin specialist, called upon office-bearers of various educational and social organisations to educate people about consequences of degradation of the natural barrier by hasty use of synthetic products. Majority of skin ailments were generated due to imperfect lifestyle, she warned. In pursuance of their community outreach programme, the consultants from a prestigious heart institute here organised two free medical camps yesterday. The Respiratory Chapter of Indian Academy of Paediatrics (IAP) awarded the first prize in the individual category to Dr Rajinder Gulati, a paediatrician at ESIC Model Hospital here in recognition of his contribution towards World Asthma Day (WAD) 2007 celebrations. For them, fear is fun. Despite all odds, sturdy lads at Jarkhar and surrounding villages are just re-scripting the “Chak De India” spirit by keeping alive the passion for hockey in the region. Seetal Kumar and Rajiv Jaggi won the squash championship in senior and junior categories, respectively, in the two-day Squash Championship that concluded yesterday at the Lodhi Club.